Here's a stats and skill build for the Thief job class in the MMORPG - Ragnarok: War of Gods. This build will focus on using Daggers as the main weapon, and exclusive skills that will reinforce the weapon. Dagger Thief Sins can go for DPS builds, Dodger builds, Hybrid builds for better survivability, and even Tank builds! Refer below to learn more about the builds. - Example: 3 STR : 2 VIT means for every 3 STR, you should aim for 2 VIT. Example: If you have 60 STR, you should aim for 40 VIT, or if you have 20 VIT, you should aim for 30 STR. - Note that Ratios doesn't need to be exact always. Allocate the way you want it. Example: Go for 30 STR first then go for 20 VIT next, so in the end, you still have 3 STR : 2 VIT ratio. 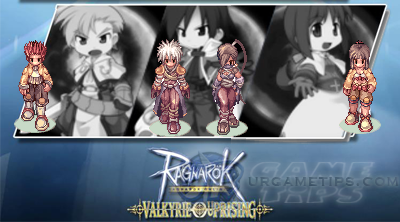 - STR: Increases your Attack damage output and Critical Hit percentage chance. Physical damage received (after calculating Defense). Note: Builds are based from Skills, and Stats from equips/items that you will get later. Choose what you think is best for your playing style, time and in-game money. - Great damage output due to Attack Speed's bonus, but has lower survivability. Relies on equipments to increase more survivability. can stop putting more AGI and invest all points to STR. Resume ratio at higher levels if needed. - Hybrid builds, with good damage and survivability, the most common builds so far. - Relies on skills and equipments for more Attack Speed. you can stop putting more VIT and invest all points to STR. Resume ratio at higher levels if needed. more heavily on equipments to compensate the lack of survivability and for more Attack Speed. - Pure Dodger build for players that mainly wants to focus on Flee and ASPD stats. with heavily upgraded high attack Daggers and items with decent Critical Rates and ASPD. and more). Note that 10 AGI = 1 Flee. - You can also add some STR, VIT, or STR-VIT if you like. Dodge Rate!. If you are looking for other tank class to play, try this build. dependent to "Party Plays" to boost up level. below). Aim for 70+ Flee from Equips and Cards, add some AGI stats if you want. Envenom Lvl 10. You may also equip any Katar to your quick slot as you alternate weapon, to use Deadly Crossing Lvl 5 and/or Meteor Assault Lvl 10 for debuffs! as you increase this skill, it's cool down will also decrease, which makes it a very good spammable skill! Double Attack. If your target has been killed by your Double Attack skill, you can quickly target another one to use this skill. 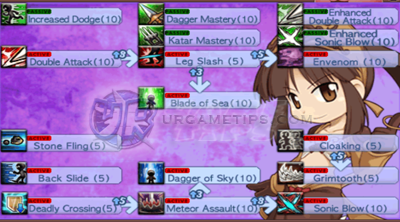 - Dagger Mastery Lvl 10 = To increase your Dagger's damage and ASPD! - Double Attack Lvl 10 = Max it. first, before Blade of Sea if you need more survivability or if you are using a Pure AGI or VIT build. Some Sins will get this later because of their high ASPD and HP Absorb % weapons. ASPD, this is actually helpful. Get this first, before Increased Dodge if you need more fire power. chance to inflict poison to target dealing 200 damage per second for 11 seconds. Get this skill instead of Enhanced Double Attack and Blade of Sea above if you are using a Pure VIT build or if you need more damaging skill. - Enhanced Double Attack = Raises Double Attack's damage to up to 32%. - Cloaking Lvl 1 = Can be used as an escape mechanism. preference now, you have the base skills that you needed most anyway. get from Daily Spins or Buy in the Cash Shop). - (STR + or ATK +) Attack Damage = The more, the better. - (Aspd +) Attack Speed = Aim for around 150~200, or more if you want. - (AGI +) = Just get what you can. - (Critical +) Critical % Rate = The more, the better. - (HP Absorb %) Life Steal = Aim for some of these very helpful stat too! - (MaxHP +) Health Points = Stop if you are comfortable with your damage intake. - (Flee +) Dodge Rate = Mostly from cards and items. - (DEF + ) Physical Defense = Mostly from cards and armor upgrades. - (VIT +) Mostly from equips, just get what you can. - (MDEF +) Magic Defense = Just get what you can, Don't focus on it too much. market), Weapon/Armor/Accessory Artificer NPCs (item crafting), Cash Shop, Event Manager, and Rankings for sample items and their stats.